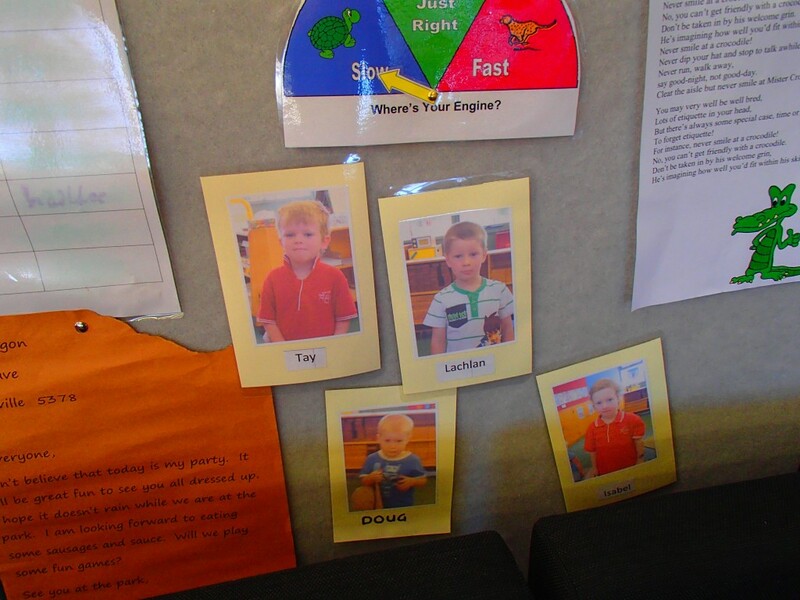 Lachlan was talking about clocks at morning meeting this week. He has a digital clock that ‘talks’ the time. 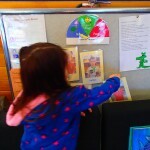 We found the clock in the Preschool room. We talked about all the other places we have clocks. In the car, tractor, towns etc. 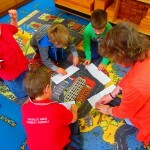 One child mentioned that the town clock doesn’t always tell the right time. We have asked the children to get photos and notice clocks wherever they go on the holidays. We are going to investigate clocks next term. We will look at clock designs, numerals, number sequence and clock features. So on your holidays start collecting some photos of clocks for next term. Isabel and her Mum brought in some native cockroaches for morning meeting. 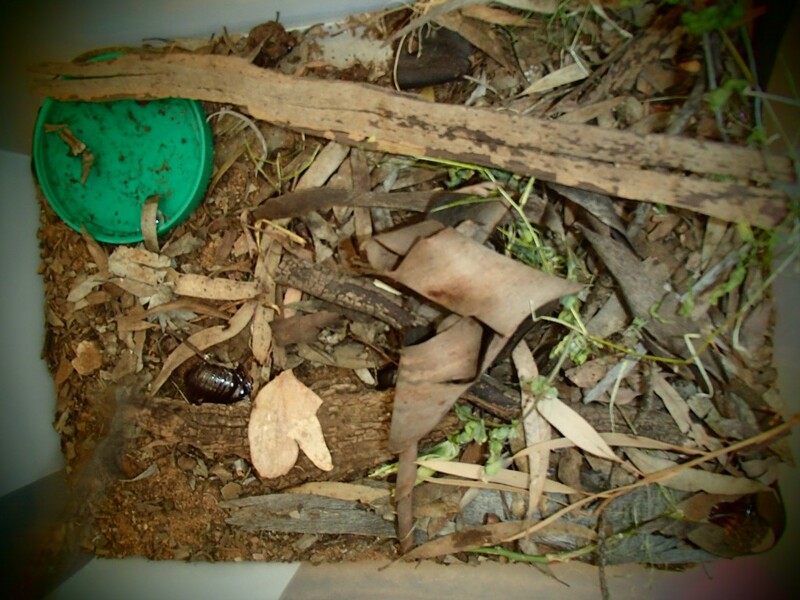 They had made a habitat in a plastic tub. 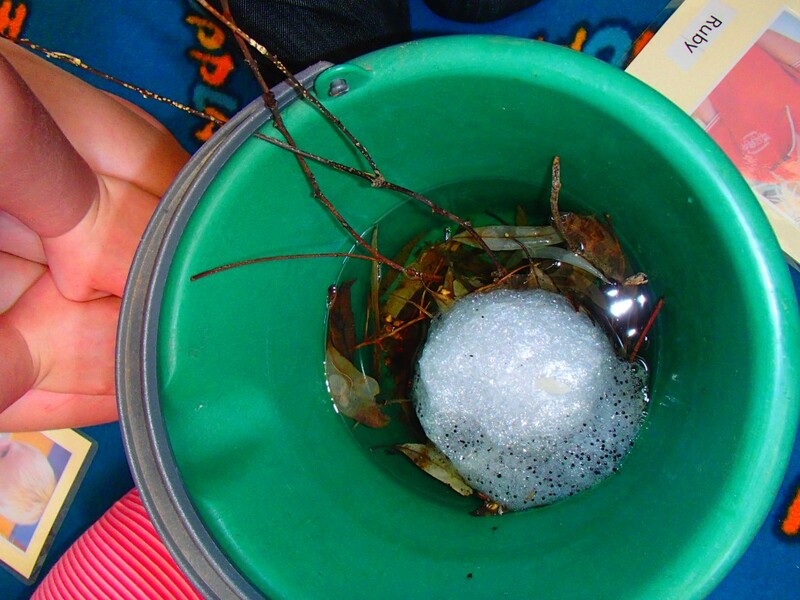 We discussed habitats. 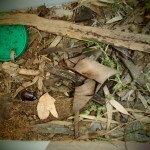 The cockroach habitat had sand, bark, leaves and water. 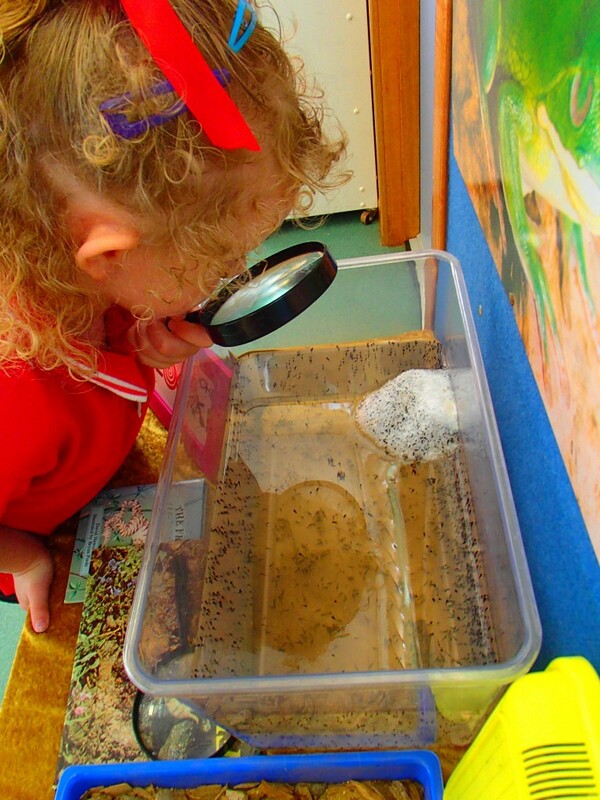 We will be learning a lot more about habitats when we go to Bush Kinder next month. 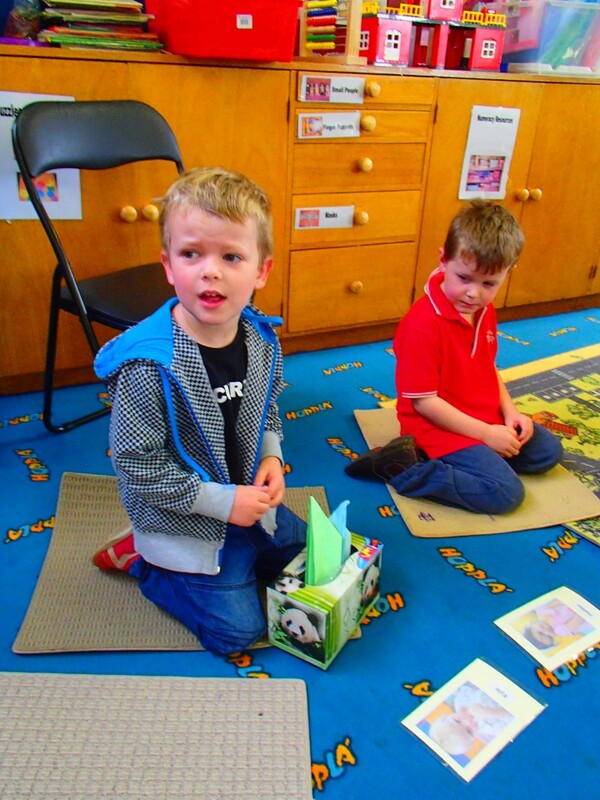 On Wednesday we had a visit from the playgroup children and parents. 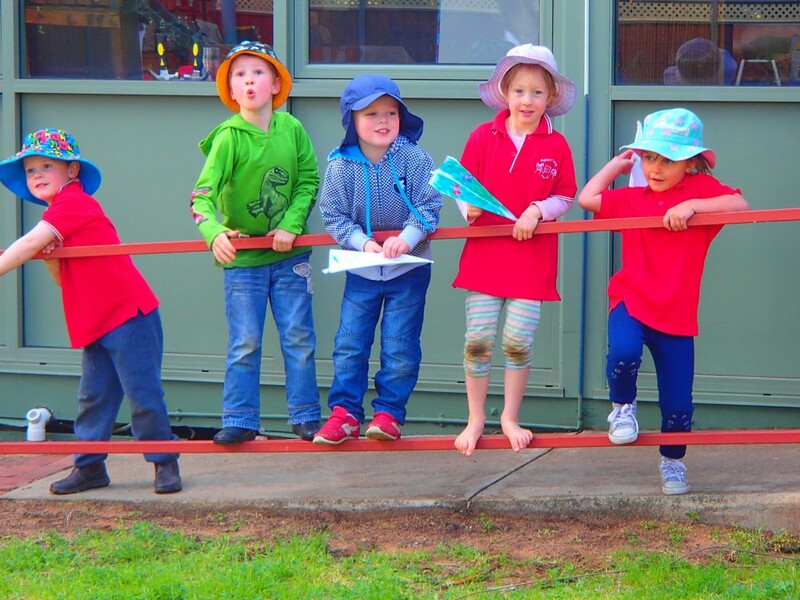 They came for morning tea and a play outside. 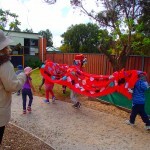 The weather was terrible but the children didn’t seem to notice. They had a good time playing with all the toys. 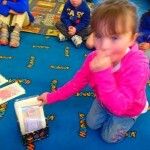 The preschool children children welcomed everyone to the centre. 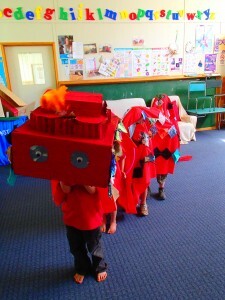 We had a talk about what our play might look like with lots of ‘littlies’ around. We hold this event at the end of each term. 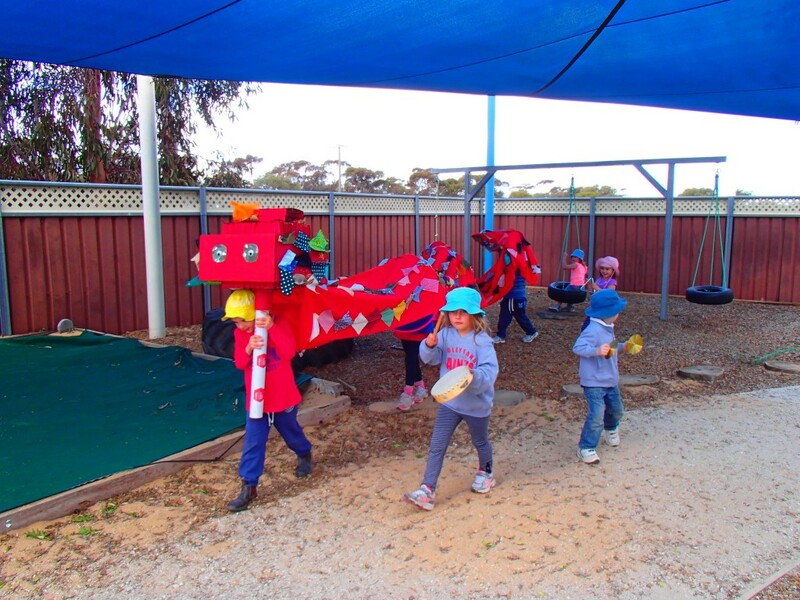 It provides opportunities for the children to become familiar with our Preschool environment before they come as three yea r olds and it allows the staff and parents of younger children to get to know each other. The Preschool children had opportunities to help the younger children and model how to play together. 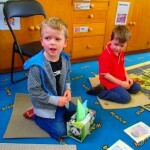 Tay brought some paper planes he had made at home to Preschool for morning meeting this week. He had a pencil in one of them to help it fly. 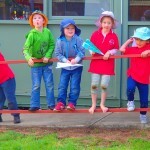 Everyone wanted paper planes. 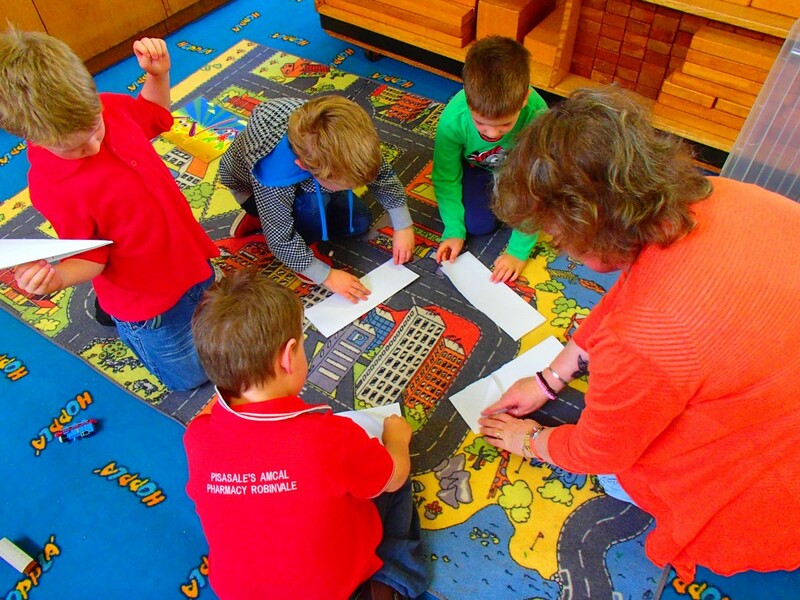 Lucky that Isabel’s Mum is good at making paper planes and she did a mini workshop to help us each make one of our own. They flew well indoors and outdoors. Some landed the right way up and some landed upside down. Some were good gliders and some landed on their noses. 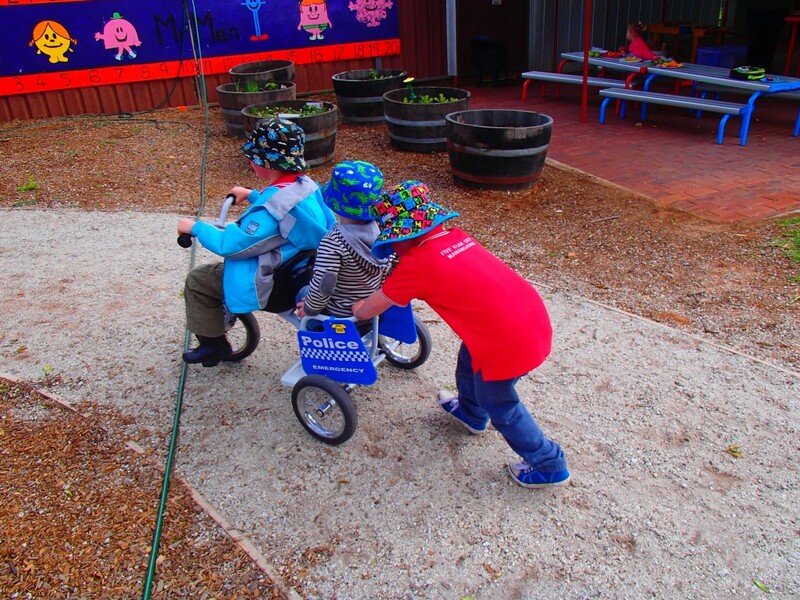 We had to experiment a lot to get them to fly and land just right. At the start of each session we sit in a circle. In the middle of the circle are our photo cards with our names on them. 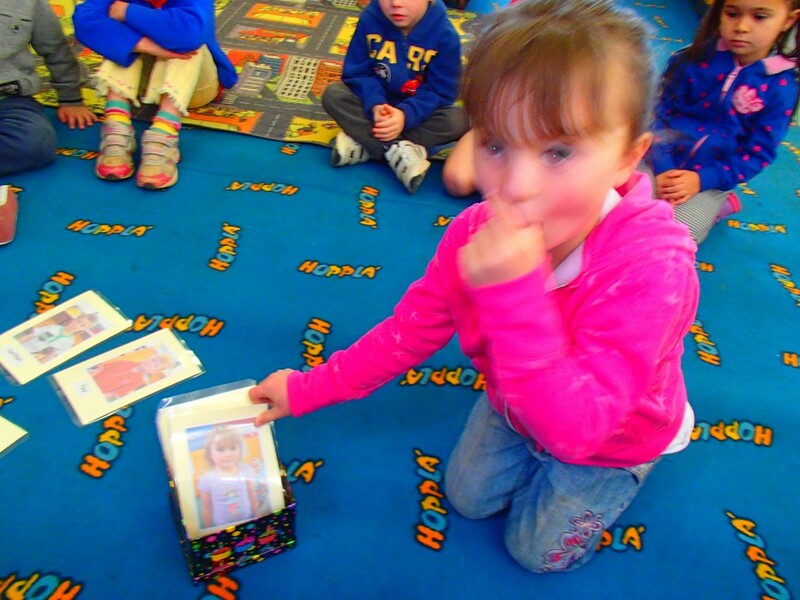 We go around the circle and children who are present put their cards in a special box. Then we see who is not here. 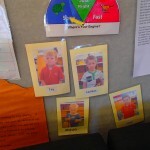 The cards of the absent children are put on the board. This task each morning is a great way to start our day. We acknowlege who is here and make a note of our friends who are absent. This routine also helps us if we have to miss a day because of illness. 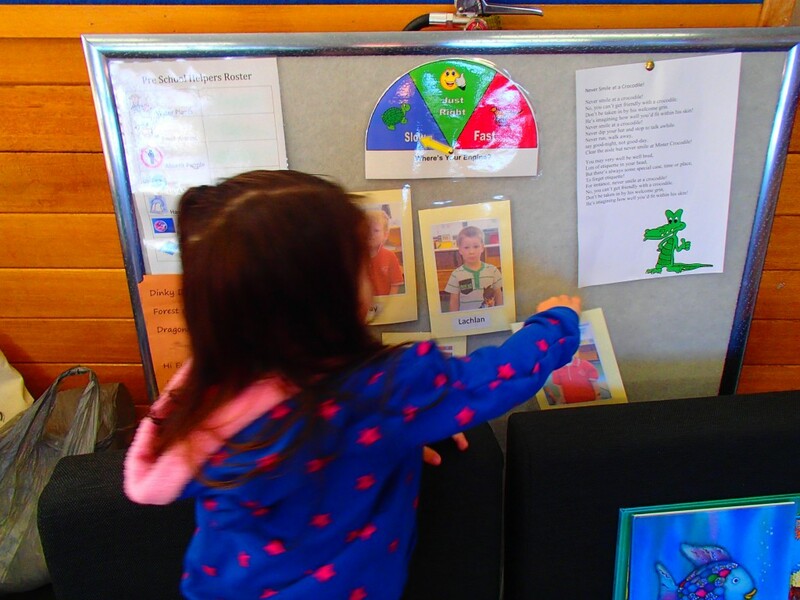 We know that while we might feel sad to miss the session , our Pre school friends will notice that we are gone and think of us. We have been doing this with the children at our centre for over two years and find that it is an excellent activity to focus on IDENTITY. 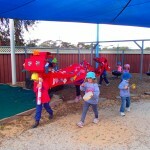 During the the last week in Term 1 we visited Tay’s house to see his new chickens. Tay has a hen called Cheyenne (after a his Pre School friend) and a rooster called Tay (after himself). 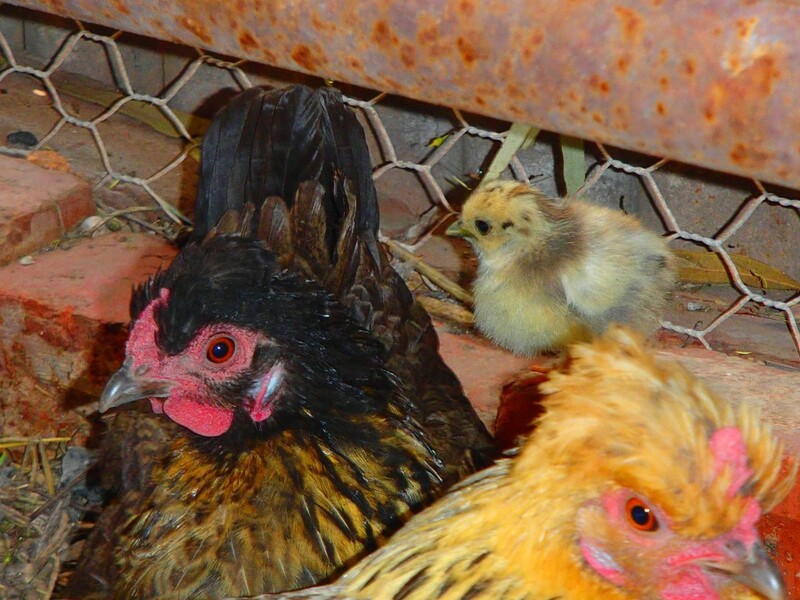 On the weekend ‘Cheyenne’ hatched out two chickens. So we went for a visit on our way home from the mobile library. Tay knew the way to his house and he was the leader of our line. The chickens were cute. We have sometimes been feeding Tay’s chickens our fruit and vegetable scraps. 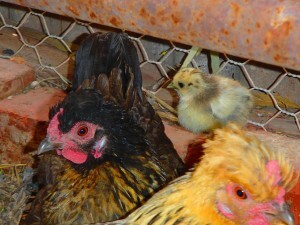 Due to the very warm weather last week our eggs hatched sooner than anticipated. 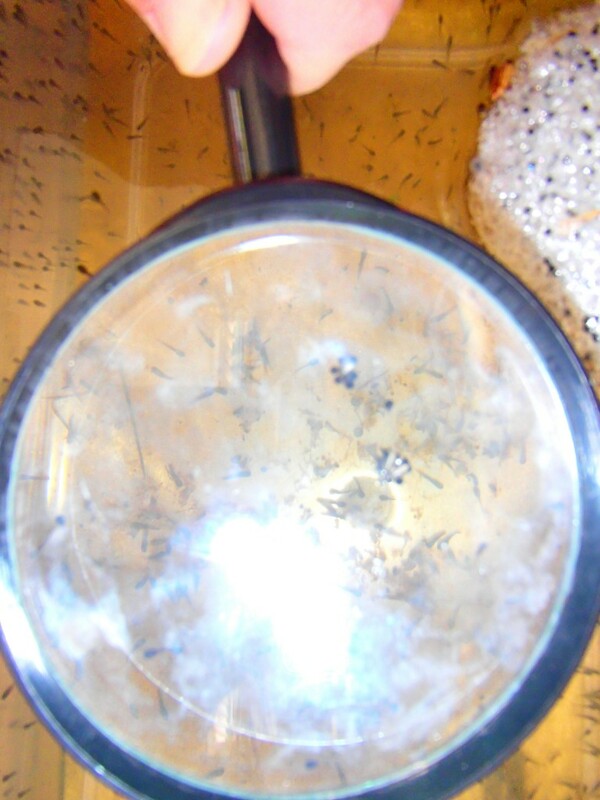 When we came to Pre School on Tuesday we saw lots of little wriggly things in our tank! 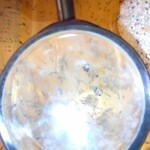 They are very tiny so we use the magnifying glass to help us see. 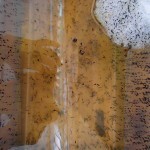 Our tadpoles are not swimming around a lot yet. 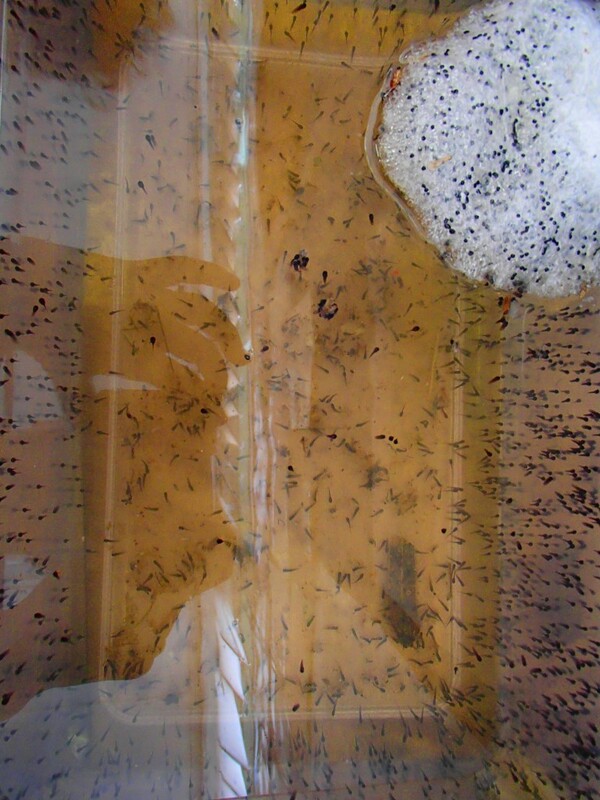 They will cling to plant matter, the walls and the bottom of the tank for up to 10 days until they mature. We will know when they have matured because they will start swimming everywhere. Then we need to start feeding them. We have boiled the lettuce leaves for 10 minutes, chopped it up and stored it in ice cube trays in the frezzer in preparation. If we don’t feed then they will eat each other! 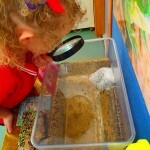 We are learning so much about tadpoles. 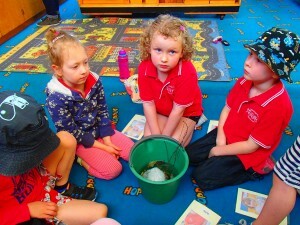 We are singing the Bonkers Beat song to learn how tadpoles change into frogs. 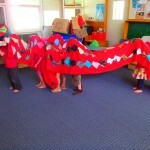 Cooper said “Let’s make a Chinese Dragon”. 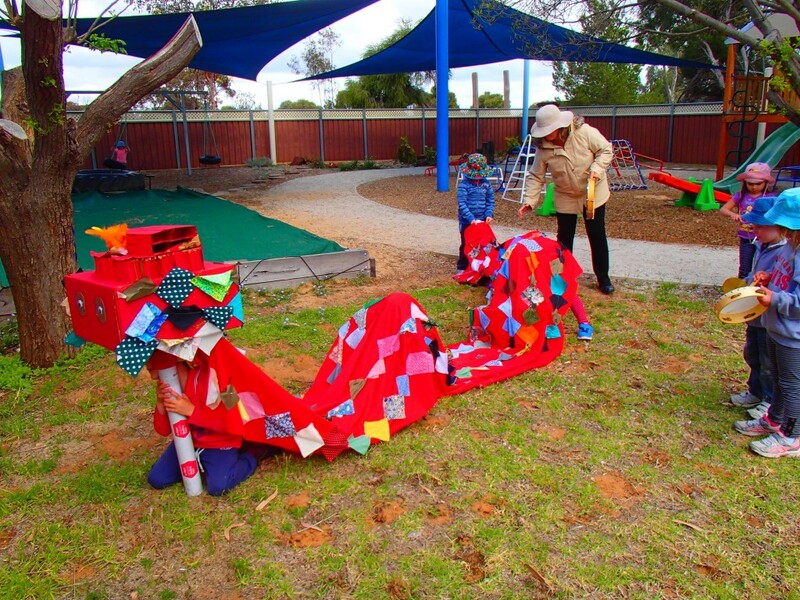 Cooper has seen a Chinese Dragon at the Bendigo Easter Fair. We pasted boxes together to make a head and then painted it red. (Red is a lucky colour for the Chinese people.) Then Mrs Grant sewed lots and lots of scrap fabric squares together to make the scales. 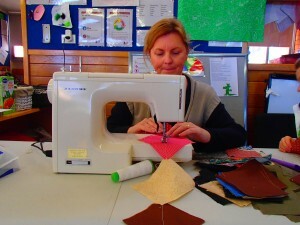 Some children had never seen a sewing maching in action and some thought we were knitting. 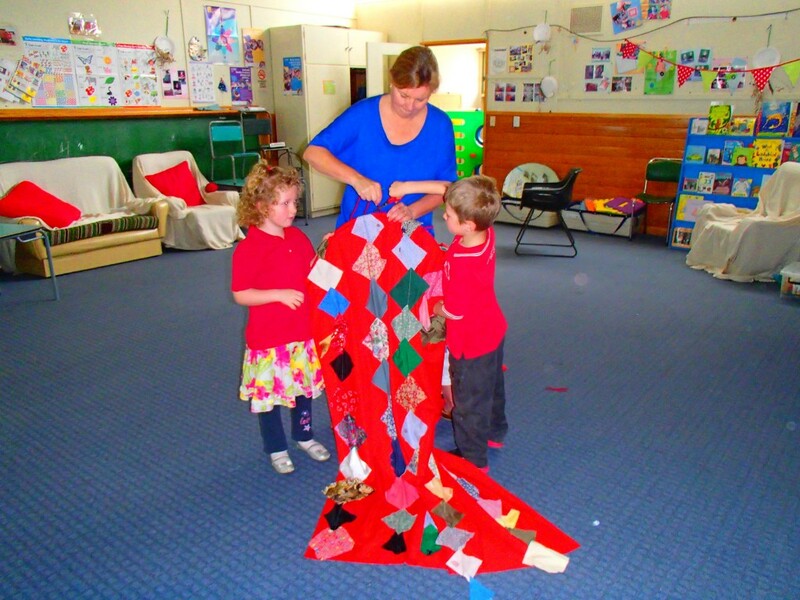 The children passed me the squares – making sure that we had no two squares the same side by side. Some children held the end and moved it forward as the chain grew. 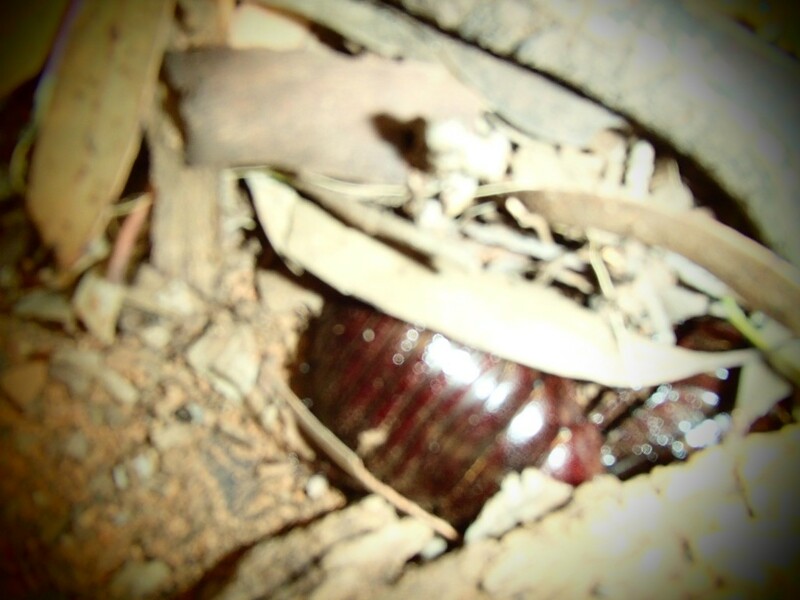 First the children were hoping it would reach the outside door – but it went way beyond that. It was exciting to watch it grow. We changed direction and went into to the hallway and beyond. It was a very long chain! 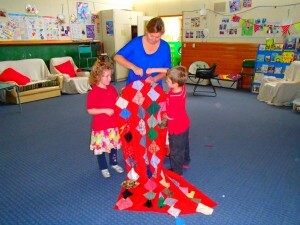 Then we laid out our red fabric and stuck the patterns on with fabric glue. 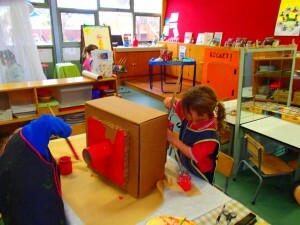 We sewed hoops into the body for the children to hold onto and decorated the head. We have been working on this project on and off for the whole term. 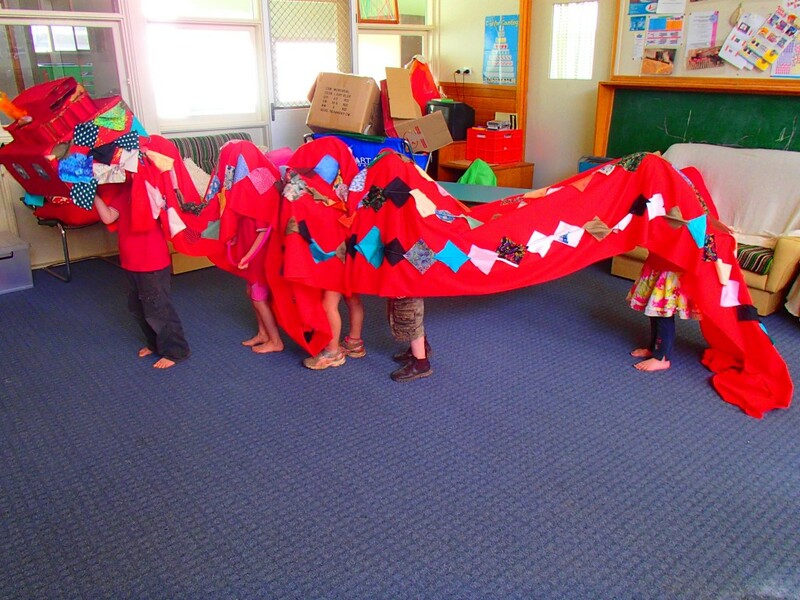 Today we watched dragons doing a ‘Lion Dance’ on YouTube so the children could see the possibilities for moving the dragon. 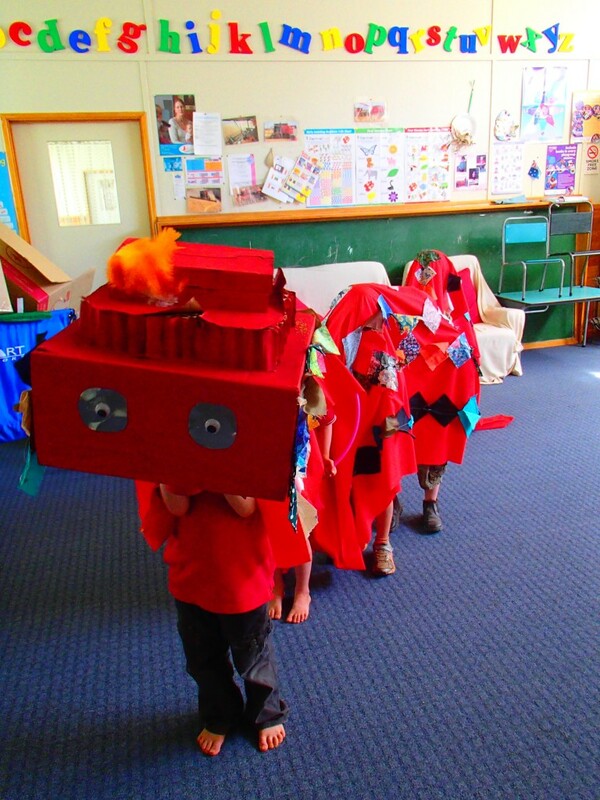 We looked at the percussion instruments the people played and watched them wake a sleeping dragon. 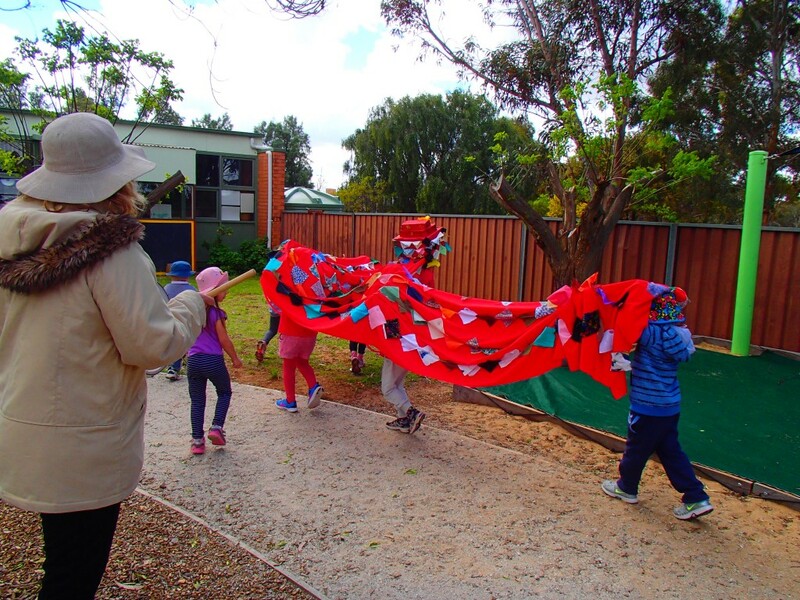 Then we took our dragon outside for a practice. 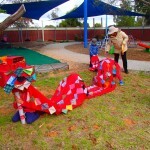 Some of the children moved the dragon while the others played the instruments. It was great fun. This will become a part of our concert for family and friends in October. 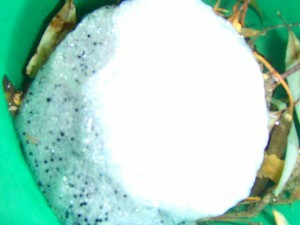 Mrs Grant found some frog spawn in the filter of her pool. Normally you wouldn’t remove frog spawn from the environment because many frogs are endangered species – however they would not have survived the pool chemicals. So now they are living at Pre School . We have googled how to look after them and the key is clean water. 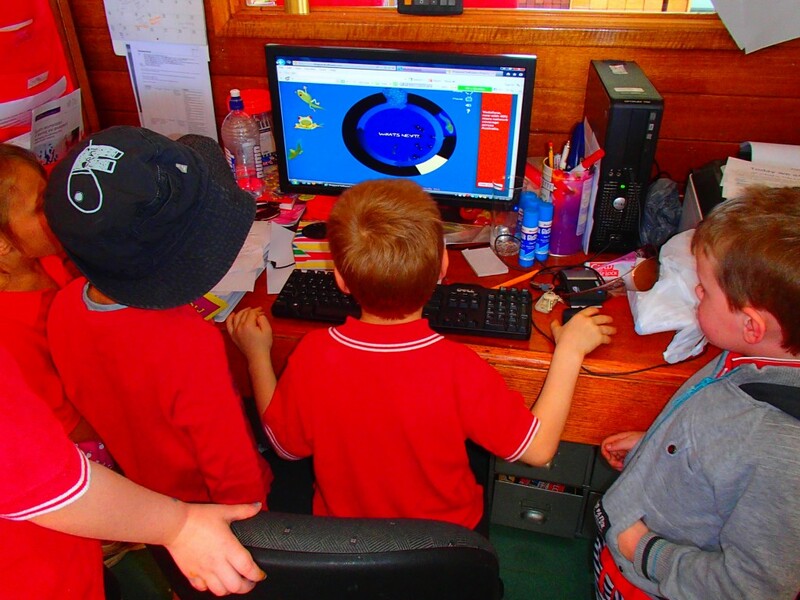 We played an interactive game on the internet. 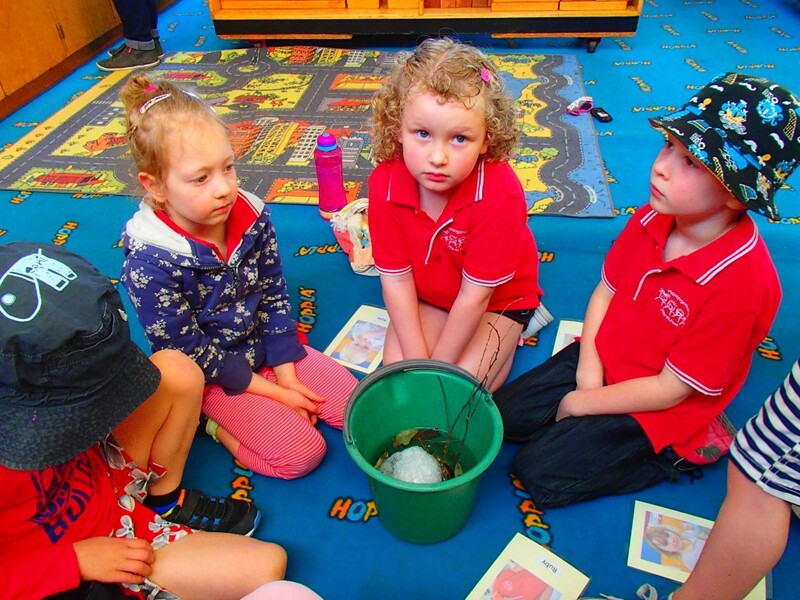 Stay tuned as we watch our tadpoles hatch and develop into frogs. http://allaboutfrogs.org/froglnd.shtml This is a great website for information about raising frogs. http://www.sheppardsoftware.com/scienceforkids/life_cycle/frog_lifecycle.htm Here is the interactive lifecycle game that the kids loved.